As you use a workspace over time, you begin to notice those things that aren’t working as well as they should. You may need to make small changes to improve the efficiency of your physical space. Since I last talked about my own space, I’ve tweaked a few things to make my workflow easier, and so I want to talk about what it looks like now. Over the December holidays, I spent a lot of time getting rid of papers that were taking up valuable space in my file drawers. I did this in anticipation of needing this space for a portion of the papers that have yet to be filed. I soon discovered that I was keeping a number of home documents that could easily be discarded. But because most of them were of a financial nature, I needed to shred them instead of simply throwing them away. My shredder was inadequate to the task, as it couldn’t handle more than five pages at a time, and it couldn’t handle staples. I replaced the shredder (the old one going to Goodwill) with one that could handle up to 16 pages as well as staples, and over a few days I was able to eliminate a huge amount of unneeded paper. I now have room for things that are currently sitting in piles. As I started to work on the contents of one such pile (my physical inbox), my electric stapler decided to give up the ghost. And so a newer and more powerful stapler (up to 20 pages) was purchased and placed in easy reach of where I sit. One of the ways to process paper is to first scan it (and then discard the printed copy), but my wireless printer/scanner was located on the other side of my home office, making the scanning process a chore. 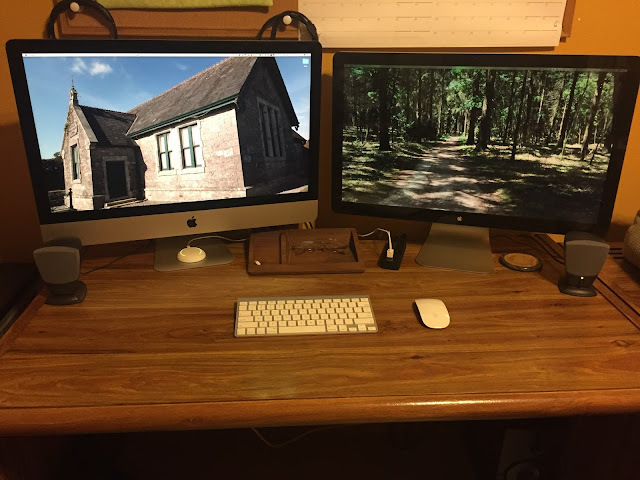 I realized that I could reorganize the space immediately to the left of my computer so that the printer/scanner could sit at arm’s length. 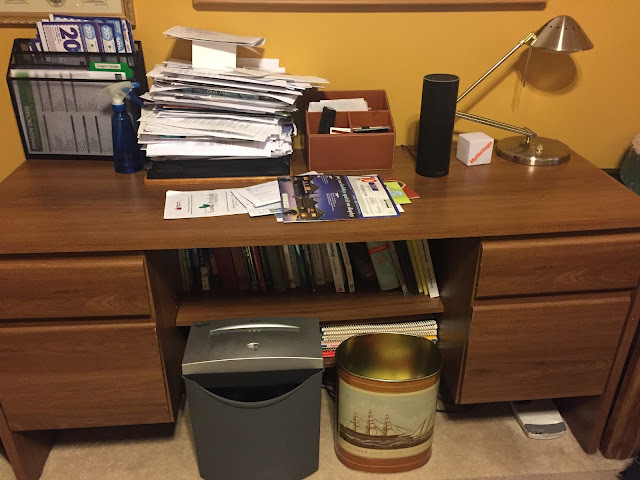 The physical inbox is located a little farther away from the computer, but a bit closer to the office door, so when the mail comes in, it’s easy to toss things into it. There’s also a standing file for a few ongoing projects of lower priority, mainly a place to put some things that I haven’t yet decided what to do with. It also has a tax folder in it to dump receipts and things through the year. Some things haven’t changed much, because they are working well where they are. 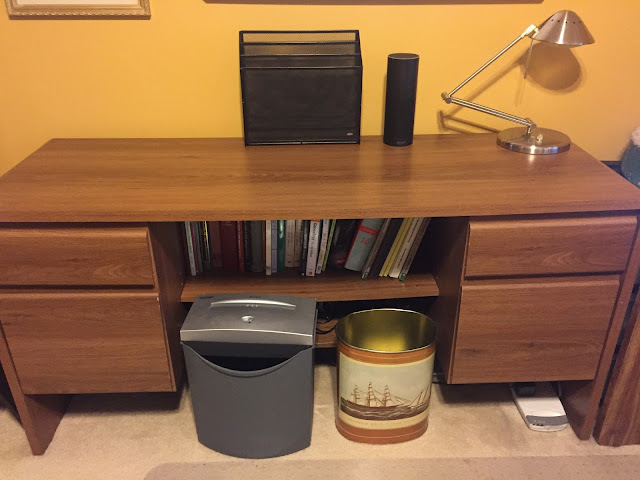 The new shredder and a small trash can sit below the credenza. On top of the credenza, the pen holder (with a Trivial Pursuit logo on it) still has a single pen in it and is easy to get to. The Amazon Echo sits there too, available to answer questions and play music. The whiteboard sits above them, mainly used to write a few high-priority words on if I need some focus on an urgent task. The headphones still sit on massive push pins at the bottom of the cork board behind the computer. The computer desk still holds the computer, the second display, the computer speakers, the keyboard, the mouse on its mouse pad, a holder for my phone and glasses, and a USB hub with 10 ports (mostly used for USB flash drives or to recharge my wireless mouse). And most important of all, the cat bed still sits immediately to the right of the second display, always ready for my research assistant, Oxford. There is still a lot of discarding, scanning, filing, and shredding to be done. 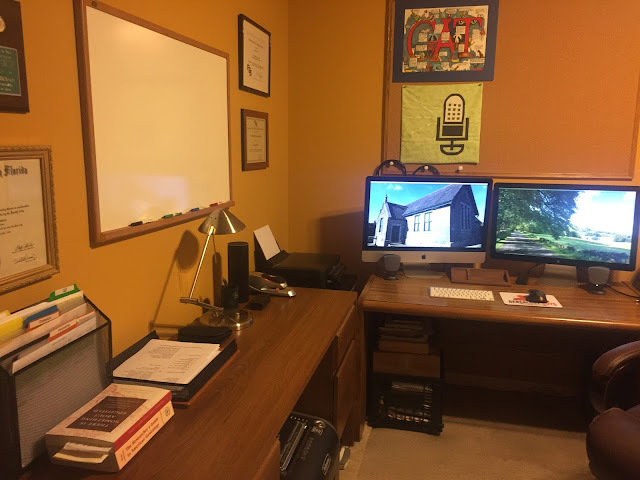 But I now have a physical workspace that meets the needs of this genealogist. I'm halfway through the 3 months I have chosen to devote to my physical organizing project (the credenza to the immediate left of my computer desk). Recently I've tinkered a bit with the items on the top of the credenza itself, moving a single pen from the desk drawer to a pencil holder, because I realized how often I need it. And because I'm using the whiteboard above the credenza to highlight the most important tasks of the day, I needed to put a whiteboard eraser just below it. The desk drawer on the right side of the credenza (the side nearest my computer desk) now provides easy access to a USB flash drive, rechargeable batteries and the recharging unit, sticky notes, and scissors and a pocket knife for opening envelopes and packages. Underneath the drawer organizer is a charging cord for my new Logitech MX Master wireless mouse. Because I'm moving toward a paperless system, I have to reconsider how I want to use this drawer. No matter how I use it, its location dictates that it should be for papers or other items that I need immediate and frequent access to. What, then, should go into it, at least for now? How about a stack of papers that require organizing? I have many of these currently in plastic tubs in another part of the office. But if I want to work through one of those stacks, having it right next to where I work would help speed the process. Eventually, once I've gotten everything scanned, I can re-purpose this space for something else. So in a later post, I'll go into the process of going through the papers. It didn't take me long to go through the small number of books that I have remaining on the shelf under the credenza, as I had already entered almost all of them into LibraryThing a few years ago. The only ones missing were my father's high school yearbook and some books that had been published in the past few years. I have no doubt that I'll have a major LibraryThing project once I turn my attention to my bookcase. But that project is for next year. Back to the credenza. It has two top drawers, and two file drawers under those. The closest top drawer is the one that needs my immediate attention. It (and the file drawer under it) can be easily reached while I work at my computer, so I need to have in it only those things that I might need immediate access to. Throughout our homes we are all likely to have junk drawers, so named because they tend to accumulate everything that doesn't seem to fit neatly into a single category. But you don't want drawers like that right next to where you work every day, because that means you're endlessly rummaging through it to find what you need. My closest drawer has a sliding organizer on top. I use it to store a single pen (the one I talk about in Organize Your Genealogy); a letter opener, a pair of scissors, and a pen knife for opening envelopes and packages; and rechargeable batteries for my keyboard and mouse. As I cleared it out, I discovered a lens wipe buried under other things, so I moved it to a more visible location. The drawer has a lot of other things too, but when I look at them, I realize that I almost never use them. It also has 10 USB flash drives. Many of these were giveaways by Ancestry, FamilySearch, or various state society conferences. I have no idea at the moment what's on them, if anything, but ideally, I should go through all of them, transfer any important files to my computer (so that they are backed up), delete everything on them, and toss the oldest ones, especially those that have relatively low storage capabilities. It has been estimated that flash drives may last no longer than 5 years (10 at best), and so they should never be depended on for long-term data storage (and do not use them as backup devices). They really serve only one valid purpose: temporary storage for transferring data from one device to another. You'll always want a few with you on a research trip (more than one in case one suddenly fails), so that you can transfer files from scanners or other researchers to your laptop or desktop computer. It occurs to me that if you obtain a new one, you should put a small label on it indicating the year it was first used, so that you'll know when it has reached the end of its reasonable lifespan. I also always label mine with at least my first name and last initial, so that it can be identified if I leave it behind somewhere. In my previous posting, I provided a photo of a credenza that sits immediately to my left as I work on my computer desk. There were obviously too many things taking up space on top, a set of books on the shelf underneath that probably included some items that I would rarely if ever consult, and a shelf beneath that one with mostly large map books. The upright file has been cleared of its store coupons (thanks to long-time podcast listener Mike Scozzari for his suggestion about putting those into large plastic storage bags and moving them to the cars, where they are actually needed). It is now ready for the occasional paper, magazine, or book that is needed for an ongoing project. The inbox (which was really just a stacking place) has been moved to another part of the office, and those papers will become part of the ones that will need to be gone through in a later project. The map books, with rare exception, weren't of any historical value and were seriously outdated, so the outdated ones went into the trash. The lowest shelf instead now holds the podcasting equipment that George and I use every 2 weeks. I reviewed the books, moving a number of them to bookshelves much further away (outside my office), and keeping only the ones that pertained directly to my current research or that were useful for reference purposes. First, I want to go through the books that I have kept on the shelf and enter them into my LibraryThing catalog. Some of them may already be there, but I'm certain that not all of them are. Second, I'll need to address what is in the drawers. Now that I've reached the end of my first 3-month organizing project, it's time to turn my attention to other things that need organizing. So between now and, let's say, RootsTech 2017, what can I work on? I'd like to work on at least one physical organizing project, so that I can make some progress in my home office. But I figure I can have two different projects going on at the same time, especially if one is physical and the other digital, so that I won't get bored. From the piles of papers on top, to the books underneath, to whatever is lurking in the drawers, there is obviously a lot of work to be done in this space! My digital project is going to revolve around my genealogy presentations. Right now it takes me too long to find the ones I need when I'm preparing for an upcoming speaking event. So I'll tackle that set of files next. 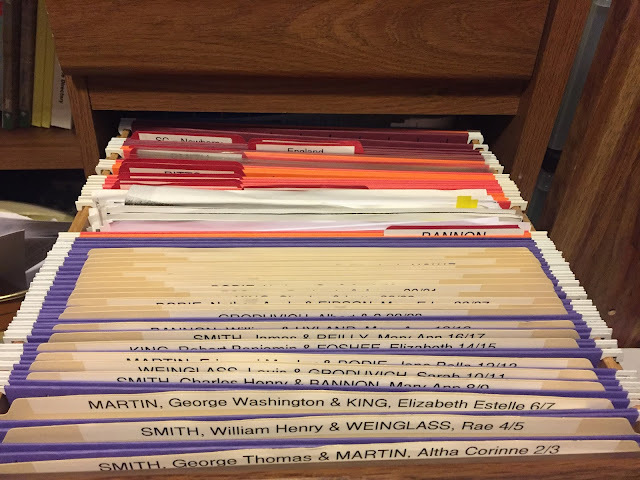 Three months ago I announced a 3-month project to organize the digital genealogy files already on my computer, so that I could then begin adding new files to an organized structure. So here we are at the end of those 3 months, and at the last major step: (re)naming the individual files. Once we have folders for each individual, it's time to name the files that will go into those folders. Because files may be copied and sent to others, the file names themselves will still have to identify who the file is about. I like to then add a year to the name, so that multiple files will sort automatically in chronological order, giving me a timeline of events for that person. This helps in identifying gaps in the documents. Finally, I want to know what type of event the document is for, as well as the type of document, such as a birth documented by a birth certificate, a death documented by the SSDI, and so forth. I have a few documents for each person that don't fit neatly into the timeline (for instance, my request to the Social Security Administration for my father's SS-5 record), so these can go into a !Misc folder at the beginning of my father's folder. There might also be a !Photos folder for photos for which I haven't yet identified the year in which they were taken. It would also be acceptable if I have found a digital document for someone but haven't yet had the time to name it appropriately. I could put this into a !To be filed folder. At the very least, these documents would still be associated with the individual that they are about. 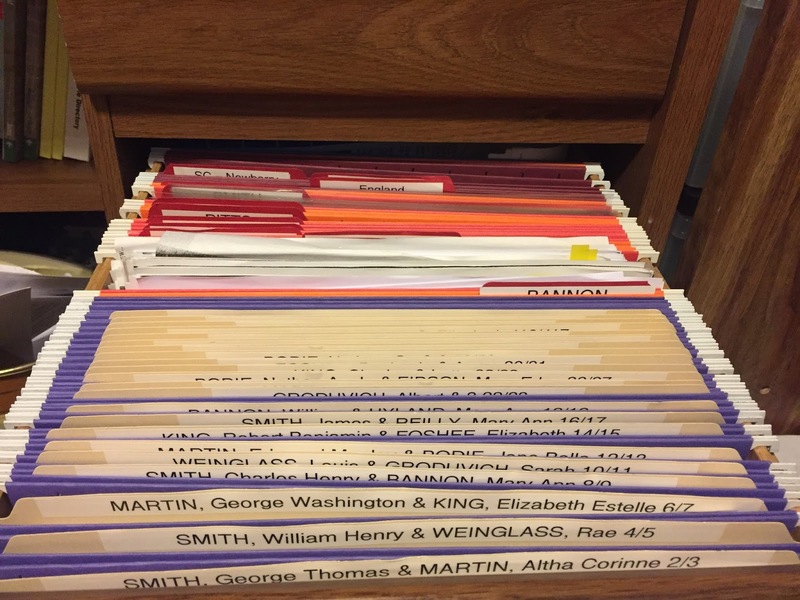 In previous postings, I've discussed the idea of creating multiple copies of documents that refer to more than one person of interest (both individuals on a marriage record, all household members on a census record, etc.). Might there be a case where you would make multiple copies of the same document just for the same person? This depends on how much you want to represent your ancestor's timeline as a series of documents. What if your only document identifying the year of birth is from a much later document (census, marriage, military, SS-5, death, and so forth)? After all, a birth certificate may simply not exist, or may elude discovery for quite a few years. I've duplicated the 1940 census record since it provides residence information for both 1935 and 1940. I can quickly review this list and see that I still need something for my mother's marriage (I have a scanned newspaper article that I haven't filed yet) and more death-related information (such as the obituary). Now I'm ready to download or scan new documents, and add them to my collection.